Castle Bridge is the newest addition to the Finzels Reach development in Bristol, England. Stretching approximately 298 feet long, the elegant, S-shaped footbridge gracefully twists a path through the historic Avon waterway. 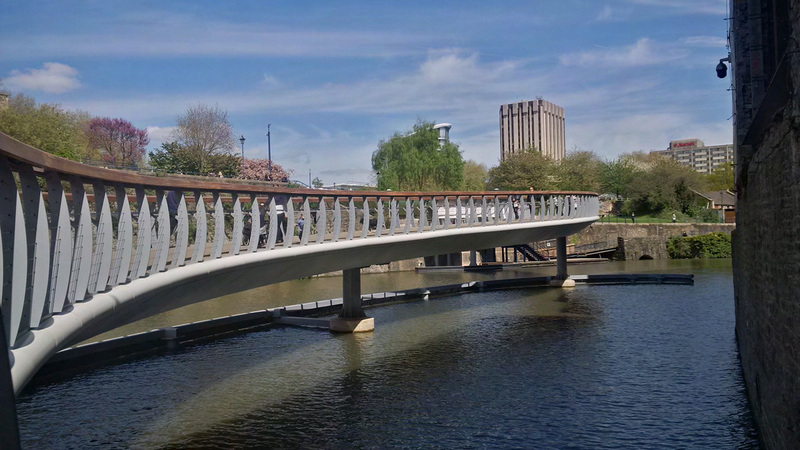 With the installation of Castle Bridge, pedestrians and cyclists alike will have a direct link to Castle Park from Finzels Reach. The arrival of Castle Bridge is critical for the development of Finzels Reach, as the population is expected to rise to over 2,500 people by 2019. The structure also offers access to the boats and the well-used ferry services, thus improving transportation for commuters. 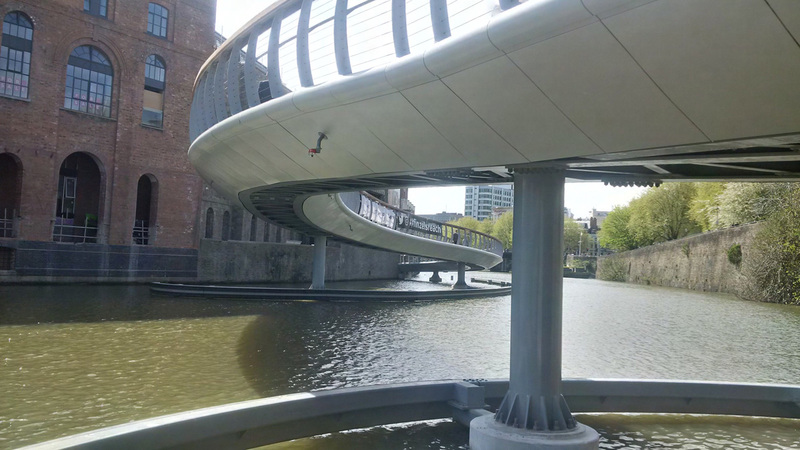 Architects Bush Consultancy worked with installer CTS Bridges in hopes of creating a structurally-sound bridge that could satisfy the designers’ creative vision. Creating the bridge, however, was no easy feat. The architects and installers found difficulties in producing the unique S-shape of the bridge. CTS Bridges elaborated on the issue, stating, “Modelling the double curvature of each of the beam sections of the bridge as a whole presented a challenge due to the spiraling effect that can be realized in manufacture but cannot be realized fully in the model.” Because of the bridge’s complex concept, each design element was carefully considered by the team. The final design, a beautiful and intricate curved structure, required specialist divers to help prepare the area for underwater work. Additionally, canal floats that carried construction materials to the site were utilized. Castle Bridge is comprised of painted steelwork and hardwood decking protected with A&I Coatings’ Vitreflon, a high-performance fluropolymer. Enhanced with Lumiflon FEVE resin technology, surfaces that are coated with Vitreflon are benefit from excellent durability, weatherability, and high color and gloss retention.